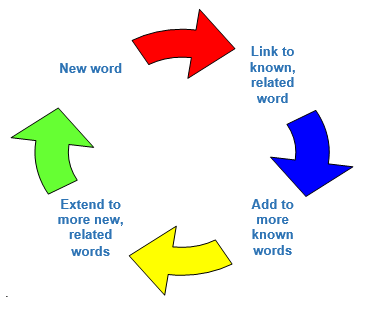 One of the methods which seems to prove highly effective in retaining new words and expressions is to link or connect them to existing vocabulary. As we have already mentioned, it is still very important to group words together, but this does not mean that you should only record new words. Once you have done this, it is possible for you to add existing words in order to broaden your base and then to extend your usable vocabulary to a more sophisticated level. You are also strongly advised to keep a vocabulary notebook either in a book or online. Research has shown that recording, reviewing and extending vocabulary using the strategies that we have looked at, significantly improves learners’ active and passive vocabulary. You may also like to visit these websites for further information and practice on vocabulary. Do not do all of the tests immediately; do one or two a week. 4. Finally, Free Rice is an interesting and enjoyable way of developing your vocabulary whilst helping people at the same time. Simply go to http://www.freerice.com/ and for each correct answer, you get a harder one and the website donates rice to the United Nations World Food Programme.